The home of the math worksheets education for kids aged Kindergarten and up! Is your child struggling with Math and needing help? Homeschooling your child and looking for some carefully graded math worksheets? Do you want some fun printable Math games to play and enjoy with your child? Stuck on some tricky math homework and need some support? 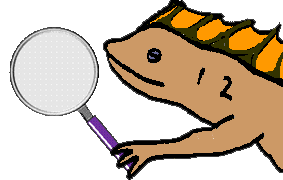 Then look no further...the Math Salamanders are here! A huge bank of free educational Math worksheets. Graded sheets so that you can easily select the right level of difficulty. Fun Math activities, puzzles and games to play. Practice worksheets to help your child to learn their basic math facts. The Math Salamanders caters for all Elementary grades, from Kindergarten up to 5th grade. You can easily find the correct level of Math Worksheets education to suit your needs by clicking on the age category. Use the link below to find the resources you need...FAST! Alternatively, you can type your search into the search box at the top of each page. 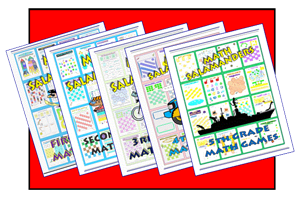 We have a range of fun-packed Math games booklets for sale. There is a booklet for each grade from 1st to 5th. Each booklet is designed carefully to develop the math skills that kids need to learn in that grade in a fun and motivating way. Try out our online practice zone for testing your math skills. There are zones for practicing addition, subtraction, multiplication, division as well as place value and fractions. We have a selection of online calculators which are free to use. Our calculators include fraction, decimal and percentage calculators as well as conversion calculators and formulae calculators. We have a wide range of place value worksheets from tens and ones up to decimals with up to 3dp. In our Fractions area, you will find our range of free fraction resources and printable fraction worksheets. Take a look at our printable addition, subtraction, multiplication and division sheets. There is a huge selection of sheets including coloring sheets, charts, worksheets and challenges. In our Money area, there are printable money worksheets, including counting money worksheets, counting money games, and adding and subtracting different money amounts. In our Geometry area, you will find our selection of free geometry worksheets. The free sheets include 2d and 3d shape sheets as well as sheets about nets, geometric formula and symmetry. Here is our selection of free printable Cool Math games for kids. There is a wide variety of games including dice games, math fact games, logic games and other fun math games for you to enjoy. Here you will find our conversion charts for converting different measurements. There are charts for converting metric to standard units, converting celsius to fahrenheit as well as converting fractions, decimals and percentages. Here is the Math Salamanders Free Math Help area. There is a range of online math help from math videos and support pages to worked examples and practise worksheets to help your child with their math learning. All the math worksheets printable and other math resources found on this website are original math materials produced by the Math Salamanders. We hope you enjoy using this site and find the materials useful. If you have used our website and found our resources useful, please consider making a small donation to help with our costs. All donations are made through Paypal. You can also support us by liking our site on Facebook!